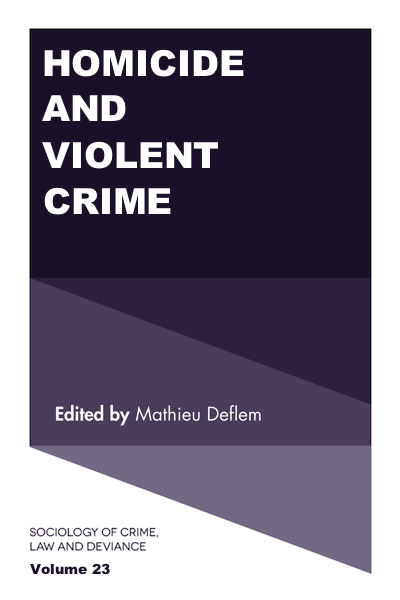 This book is published as Sociology of Crime, Law, and Deviance, Volume 23. Bingley, UK: Emerald Publishing, 2018. The chapters in this book are devoted to the social-scientific study of violence and homicide. Ranging from concerns over accusations of domestic abuse to killings in our cities and across the world, violent crime and homicide have stayed with us, not as mere remnants of a past we cannot shake, but as expressions of certain dynamics and strains of our world of today. The authors tackle some of these important issues and questions with a variety of theoretical frameworks and methodological tools as applied to a number of relevant offenses. Click the icon below for free access to selected content! This book can be obtained from internet stores and via resellers. Consult the online version (subscription) and other volumes of Sociology of Crime, Law and Deviance.